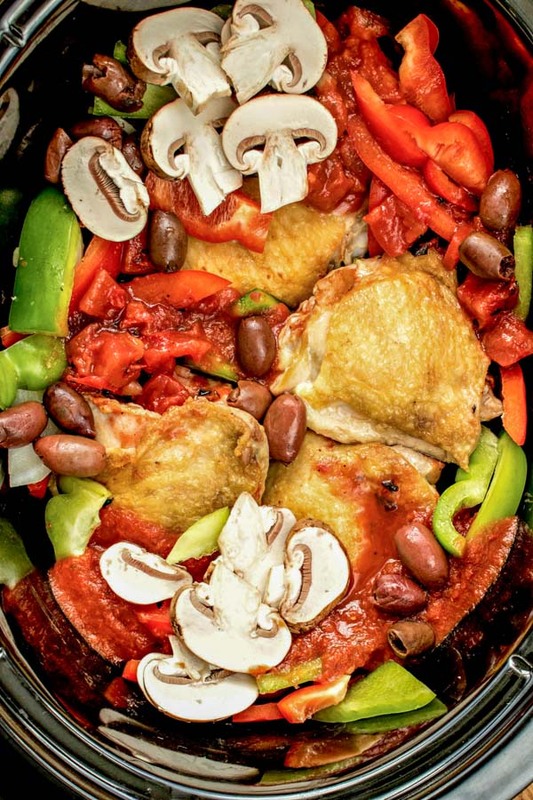 Slow Cooker Chicken Cacciatore - Home. Made. Interest. 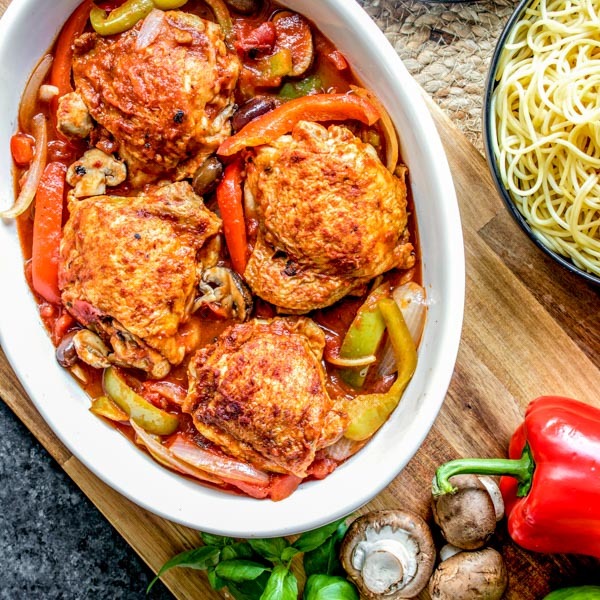 Slow Cooker Chicken Cacciatore is a rustic Italian dish with braised flavorful bone-in chicken slow cooked in a luscious tomato sauce and aromatic vegetables that will change your life! Slow Cooker Chicken Cacciatore is one of my all-time favorite comfort foods and one of the best things about it is that it only gets better with time. That means you can make it on a Sunday and have it for dinner Monday night and it will taste even better. It makes getting dinner on the table during the week even easier! 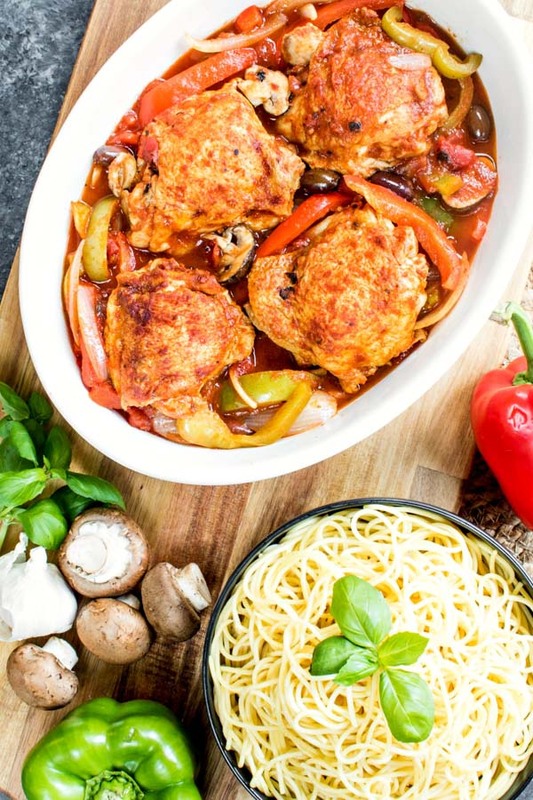 Cacciatore means “hunter style” in Italian and in the culinary world a hunter-style dish is a dish prepared with with onions, herbs, usually tomatoes, often bell peppers, and sometimes wine. There are lots of different variations, some use rabbit, I use chicken. Sometimes it has red wine, sometimes, white, sometimes none at all. You can make it with or without mushrooms. I add olives to mine but it a lot of recipes don’t. Basically, it’s a simple recipes and the main rule is that it should be full of flavor. 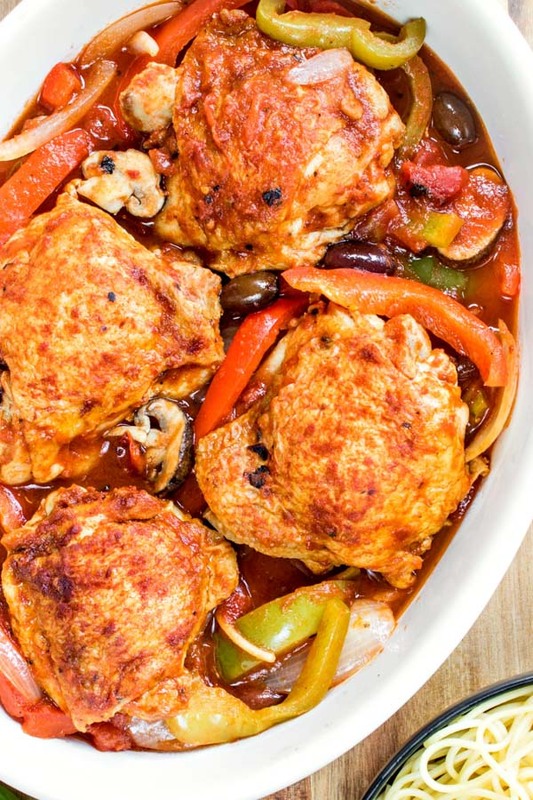 This easy Slow Cooker Chicken Cacciatore is all about the sauce. It starts with a combination of diced tomatoes and crushed tomatoes, then you add a mix of green and red peppers, onions, olives, mushrooms, and garlic. All of that simmers, along with chicken thighs, for 4-6 hours in your slow cooker and when it is done you have a delicious sauce and perfectly tender braised chicken. The sauce takes on the flavors of the peppers, onions, olives, and garlic and becomes this rich, delicious sauce you’ll want to put on everything. 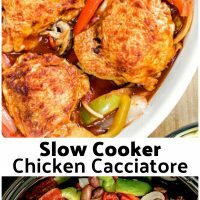 Serve Slow Cooker Chicken Cacciatore over some creamy mashed potatoes or polenta, rice, or pasta and you have a complete meal! If you prefer white meat you can substitute chicken breasts for chicken thighs. You can also use skinless chicken breasts or thighs if you prefer. I like the extra flavor that cooking chicken with the skin on adds. If you use skinless breasts or thighs you can skip the browning step. Save time by chopping all of your vegetables up the night before so all you have to do is throw everything in the slow cooker in the morning. Like this recipe? 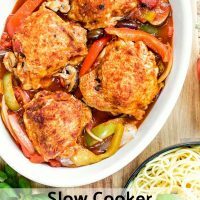 Pin it to your Slow Cooker Recipes board! Mix 1 teaspoon of salt and pepper and sprinkle over the chicken. Heat olive oil in a medium skillet (I love using cast iron) over medium-high heat. Place about 1/2 of the chicken pieces in the skillet skin side down. Cook until browned, about 3 minutes each side. 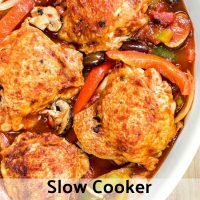 Place browned chicken in the slow cooker while you cook the remaining chicken. Repeat. Meanwhile: add onions, peppers, olives, mushrooms, garlic, crushed tomatoes, diced tomatoes, chicken stock, and remaining 1/2 salt to the slow cooker. Serve over polenta, mashed potatoes, pasta, or rice and enjoy!